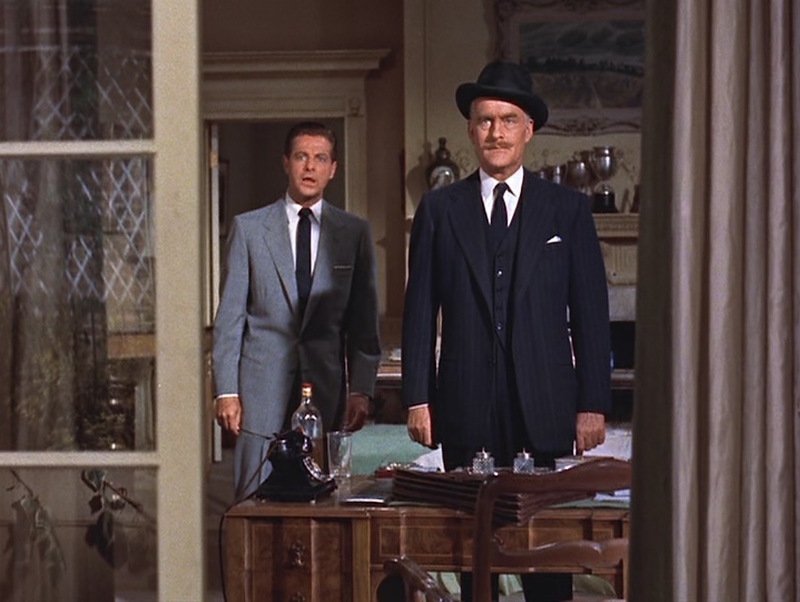 This year’s Halloween post is a Suits and Suspense Spook-tacular, exploring the possible meaning behind the menswear of Hitchcock’s classic Dial M for Murder as well as an appreciation of some damn fine 1950s tailoring! 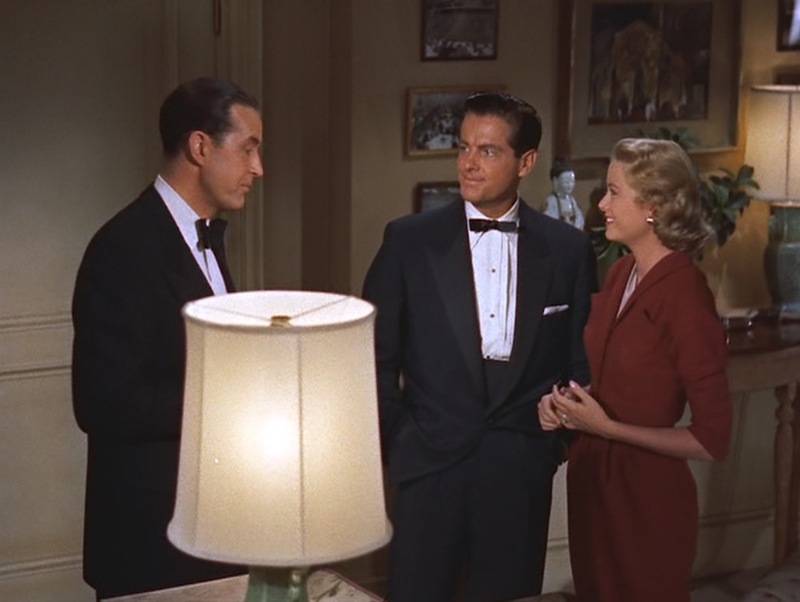 Dial M for Murder, in case you haven’t seen it, is a sophisticated yet chilling thriller starring Ray Milland and Grace Kelly as married couple Tony and Margot Wendice whose secrets from each other drive the plot. Her secret is that she’s having an affair with American writer Mark Halliday (Robert Cummings); his secret is that he wants to kill her. Rounding out the cast is John Williams reprising his role from the Frederick Knott-penned stageplay as the sagacious Inspector Hubbard and Anthony Dawson as the crooked con man contracted by Tony to carry out the deed against Margot. This exploratory feature post is going to be a little different than past pieces, serving up every outfit worn by the major male characters over the context of the entire film. 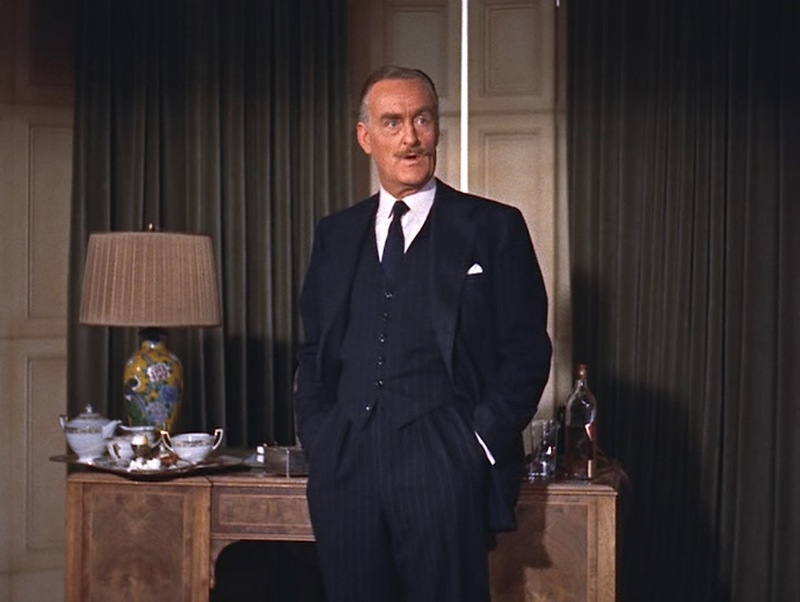 That means this post will be packed with a staggering 12 outfits… not to mention a level of extrapolary detail that reveals, if nothing else, that I spend far too much time thinking about men’s style in the movies. Time for a drink! Mark’s gray semi-solid suit: Single-breasted, three-button jacket with notch lapels, welted breast pocket, straight jetted hip pockets. Likely pleated trousers with turn-ups/cuffs. White shirt with spread collar and double/French cuffs. Navy silk tie. Navy wool v-neck sweater (never seen again). Brown leather cap-toe oxfords. Brown fedora. Taupe topcoat (carried, never worn) echoes both his gray suit and brown accessories and outerwear. We next catch up with Mark and Margot in mid-affair, exchanging smooches and Scotch in the Wendice living room. 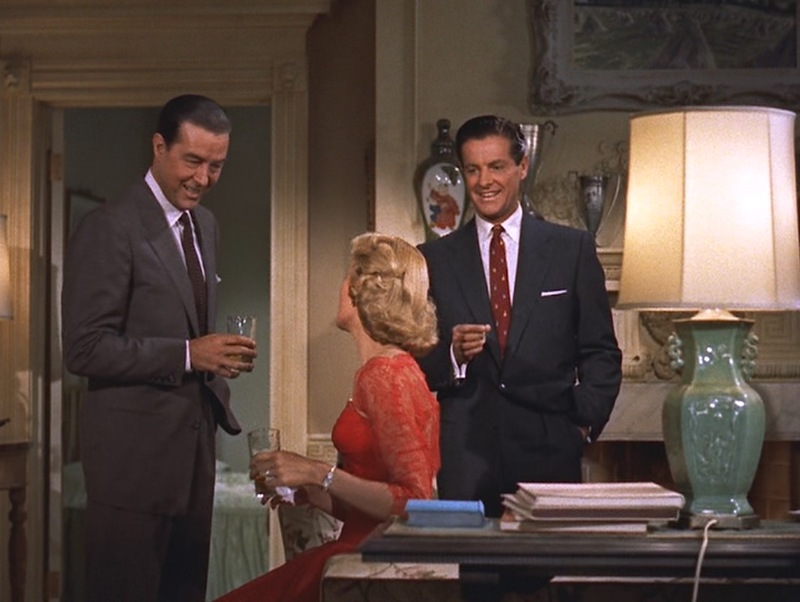 They are soon joined by Margot’s debonair husband Tony (Ray Milland), who seems blissfully unaware of the true nature of his wife’s visitor. Tony and Mark are dressed in what is essentially the same outfit: a solid-colored two-piece suit with single-breasted, low stance two-button jackets with all of the same details (white pocket square, low straight jetted hip pockets, four-button cuffs, ventless back) and even patterned ties. It’s what each man does with this “1950s uniform” that differentiates him, particularly in Margot’s eyes as she strives to settle her inner romantic conflict. Margot and her well-suited suitors. Tony, in his earth tones, symbolizes home and a grounded life that would be easy and familiar for Margot. Of course, familiarity breeds contempt as the saying goes, and Margot’s warnings to Mark about Tony’s behavior and attitudes indicate that there is something less than comforting beneath his earthy surface. Mark, on the other hand, is far more vibrant in his navy suit and red tie… more colorful and exciting to Margot if not quite as safe. Red will be established as Mark’s “passion color” and his whimsically patterned tie here reflects his relatively “lightweight” attitude as he isn’t yet preoccupied with murder and the potential death of his lover. His red tie also coordinates with her red dress and shoes, though she wraps herself in a brown mink that echoes the brown-wearing Tony’s hold on her. 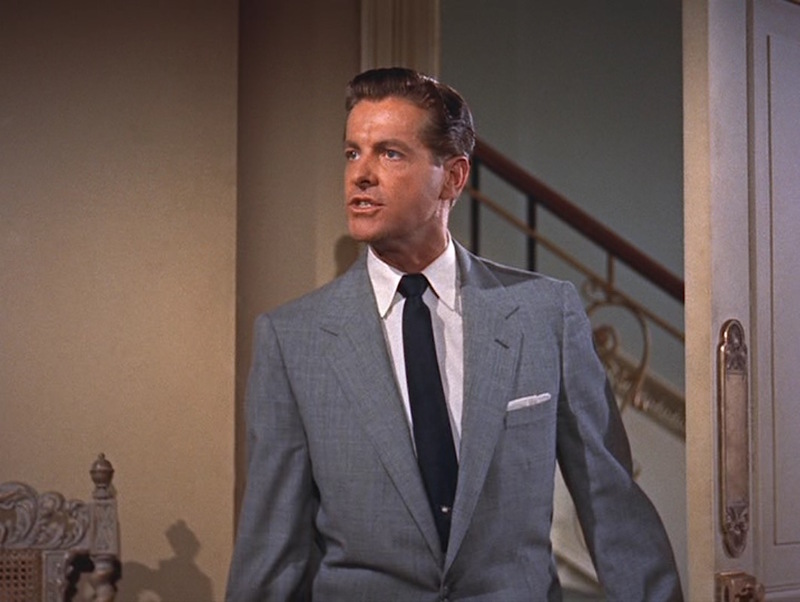 Mark’s navy flannel suit: Single-breasted, two-button jacket with notch lapels, welted breast pocket (with white linen folded pocket square), low straight jetted hip pockets, four-button cuffs, likely ventless back. Double forward-pleated trousers with side pockets and cuffed bottoms. White shirt with point collar and French cuffs (with gold cuff links). Maroon satin silk slim tie with decorative yellow and blue motif. Black leather shoes, probably oxfords. Pearl gray fedora with wide black grosgrain band. Gold wristwatch. C.A. 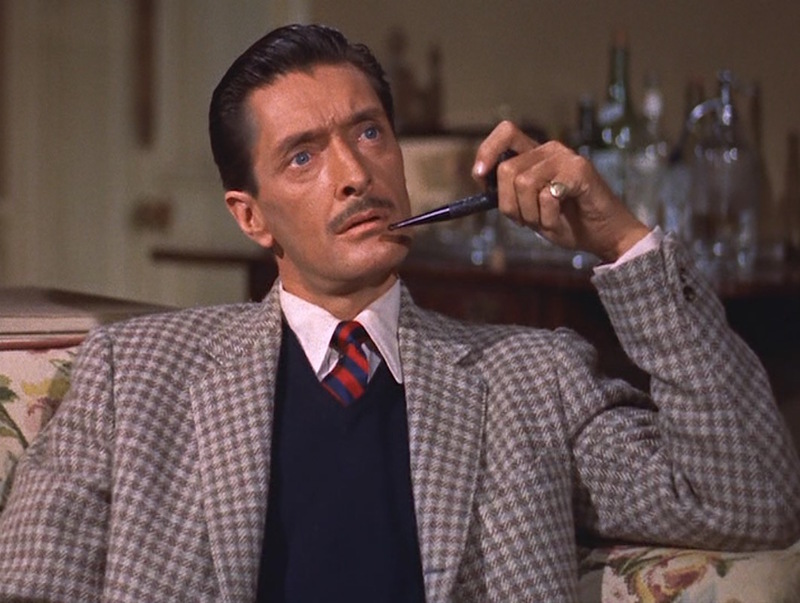 Swann (Anthony Dawson), aka “Captain Lesgate” among other names, is the only character to wear the same thing throughout his multiple appearances on screen. 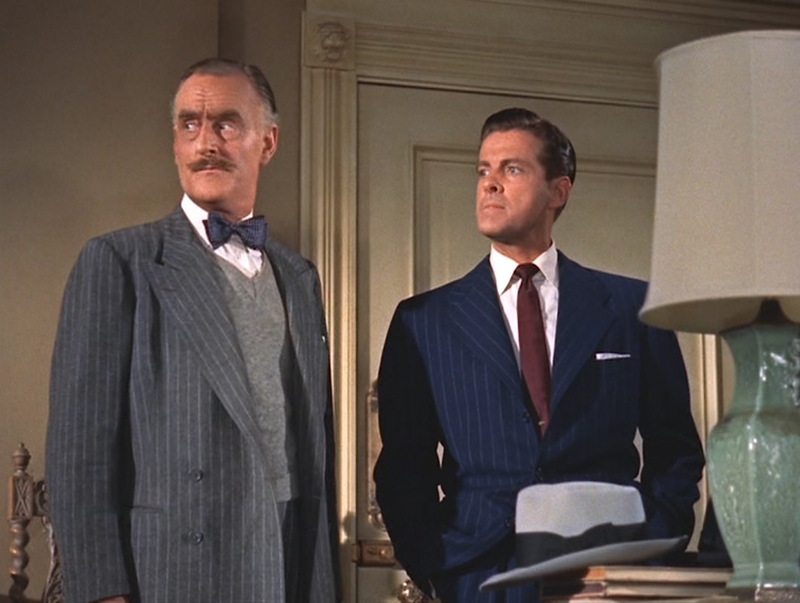 Where the other male characters prefer tasteful and traditional suits in the spirit of mid-1950s fashion, Swann opts for a louder array of patterns and colors that differentiate him from the rest of the Dial M for Murder pack. He doesn’t “belong” in this picture, and – thus – he is the only character not to survive it. C.A. Swann is a simple man. All that he’s got hidden up his sleeve is a strangely fastened shirt cuff and a string of swindled spinsters. Looking closer at Swann’s attire reveals some interesting details. 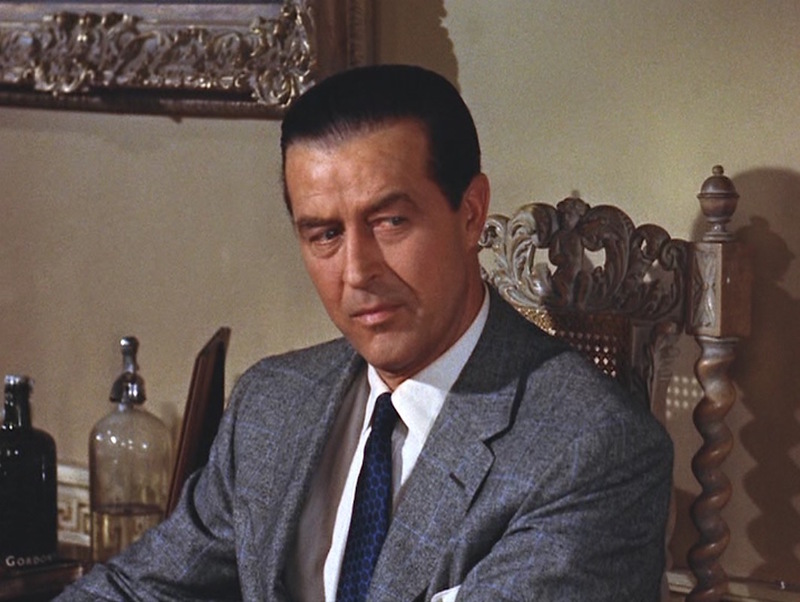 Swann curiously wears his white double-cuffed shirt with one side fastened over the other like a single barrel cuff. This unorthodox manner for wearing cuff links has sparked debate on online menswear forums, with the general consensus being that this is a sloppy and immature look at best… though it does have some proponents when worn under a long-sleeved jumper like Swann does. C.A. Swann’s outfit: Tan and brown gingham-check herringbone flannel single-breasted 3-roll-2 button sport jacket with notch lapels, welted breast pocket, straight jetted hip pockets, two-button cuffs, and single back vent. White shirt with point collar and French cuffs, interestingly worn like a barrel cuff. Red-and-navy right-down-to-left-striped club tie. Navy wool v-neck long-sleeve sweater. Charcoal flannel double forward-pleated trousers with side pockets and cuffed bottoms. Chocolate brown nubuck leather derby-laced chukka boots with hard leather soles. Gray gabardine twill trench coat with epaulettes, 6×3-button front, belt, straight side hand pockets, and adjustable two-button cuff tabs. Cream cashmere scarf. Gold watch, left wrist (though a later close-up depicts a steel watch on a dark brown leather band) and gold signet ring, left pinky. Tony invites Mark along to a Saturday night stag party at his club, for which the rules of black tie would dictate men in dinner jackets. Lucky for Mark that he brought his tux across the pond! As he tied his thin, double-ended black satin tie, he paused for a moment and examined himself levelly in the mirror… He looked carefully round the room to see if anything had been forgotten and slipped his single-breasted dinner-jacket coat over his heavy silk evening shirt… He… gave a final pull of his narrow tie and walked out of the door and locked it. Tony opts for a less formal approach, sporting one of his regular white shirts with buttoned barrel cuffs! This breach in formality may be surprising coming from the Brit rather than the American, but it’s worth accounting for the context of the scene. By early 20th century standards, any situation with no women present automatically downgrades the degree of formality; formality would be further relaxed during the World War II era as men were more frequently dining out in regular business suits. Thus, Tony could be given some leeway when sporting his less-than-formal shirt with a dinner suit for a stag party at his men’s club. Mark’s Black Tie Ensemble: Midnight blue single-breasted dinner jacket with straight-gorge satin-faced peak lapels, welted breast pocket (with white linen folded pocket square), straight jetted hip pockets, four-button cuffs, no vents. Midnight formal forward-pleated trousers with very high rise and likely plain-hemmed bottoms. White traditional formal shirt with long point collar, widely pleated front (with studs), and double cuffs. Black batwing bow tie. Navy raincoat with set-in sleeves and adjustable single-button tab cuffs. Mark’s outfit may be more fashionable for the mid-1950s, but Tony’s more traditional ensemble proves to be timeless. 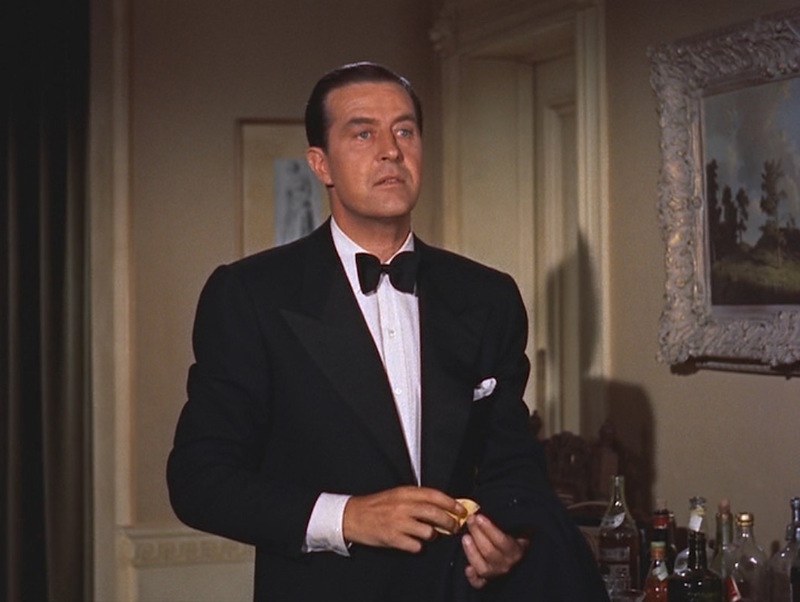 Tony’s Black Tie Ensemble: Black single-breasted “drape cut” dinner jacket with wide satin-faced peak lapels, slanted welted breast pocket (with white linen folded pocket square), straight jetted hip pockets, four-button cuffs, no vents. Black formal satin side-striped forward-pleated trousers with side pockets and plain-hemmed bottoms. White shirt with spread collar, front placket (with mother-of-pearl buttons, not studs), and single-button squared barrel cuffs. Black butterfly/thistle-shaped bow tie. Black patent leather oxfords with black socks. Black overcoat (carried). Note Tony’s informal shirt with its front placket and button cuffs. The next day, Tony Wendice is carrying himself like a man who has gotten away with “the perfect murder”. His suit and tie are exquisitely coordinated as his navy tie echoes the blue windowpane in his beautifully textured gray flannel suit. He’s as smooth as he looks, adapting to a major wrench in his plans and still adeptly engineering things to achieve his nefarious goals. It is tailored and styled exactly the same as his previous taupe suit, but his look now channels cold calculation rather than warm groundedness. Ice and steel. 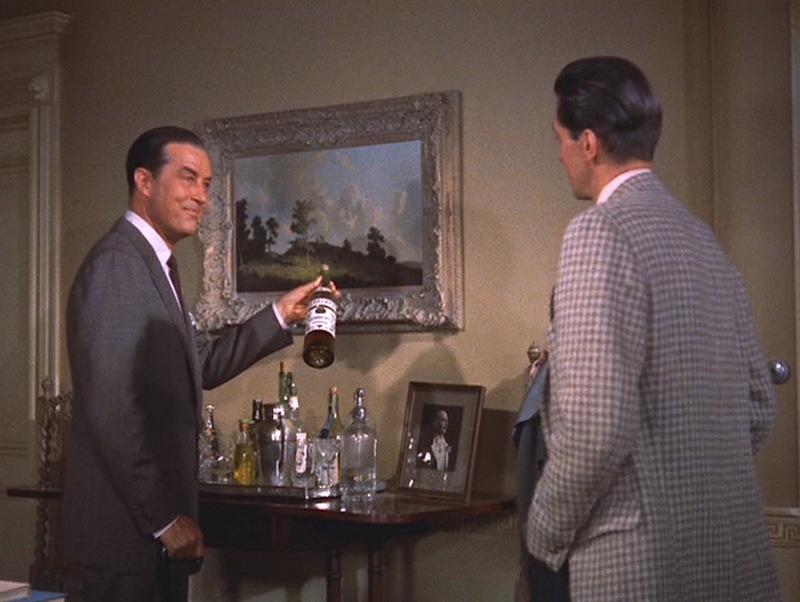 Note also the black bottle to Tony’s right, labeled “Gordon’s.” Is this the Wendice household’s preferred gin? 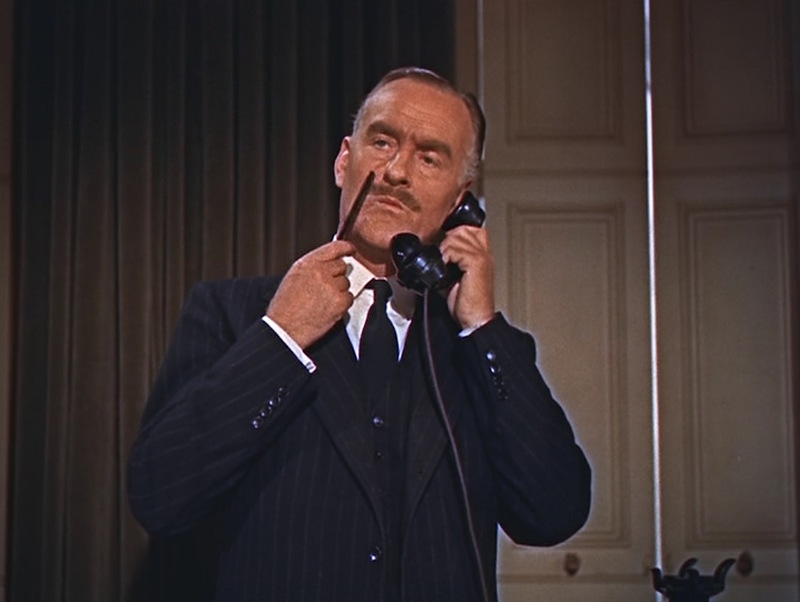 At this point, the only potential major obstacle could be the police, but when Chief Inspector Hubbard (John Williams) arrives at the door also sporting a gray suit and blue patterned tie, it’s clear to the viewer that these men are in the same league… at least for now. These variations on the same theme subtly indicate a uniform of coldness as both are pressuring Margot and, in turn, indicting her. 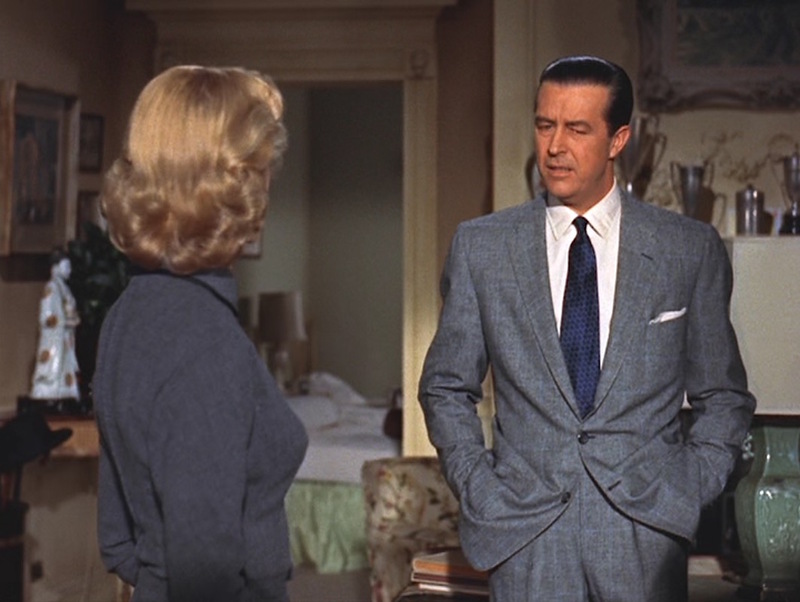 The more old-fashioned Hubbard is hardly wearing the exact same thing as Tony, rather just the same colors, and he is the only major character to break from single-breasted tailoring to sport a double-breasted jacket. 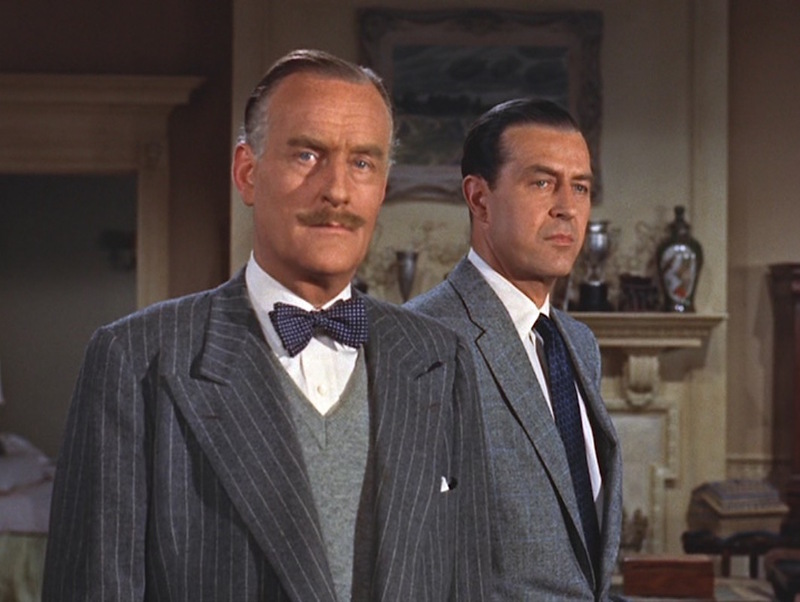 Hubbard’s bow tie and jumper are a clear contrast to the sleek two-piece suits of the two men who are silently vying to control Margot’s future. 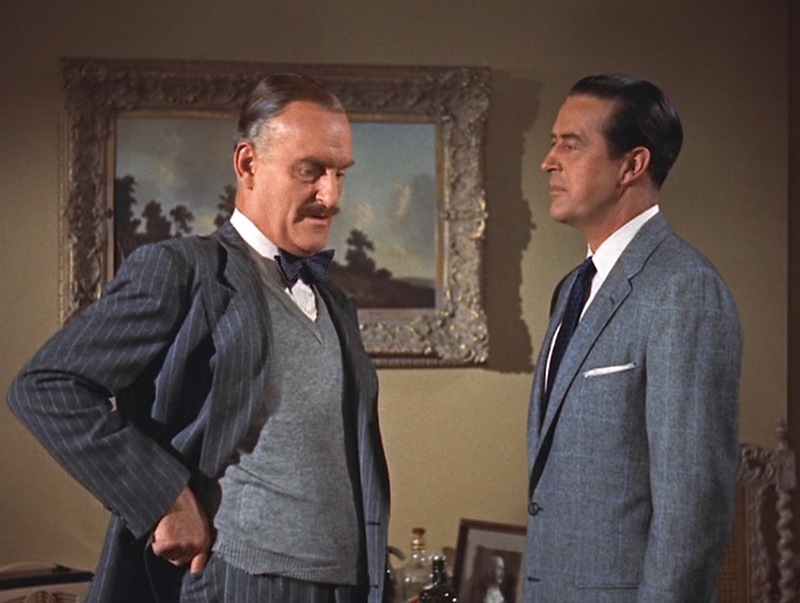 The bit of fraying on the bottom right ribbing of his sweater is just enough to not outright ruin the garment, and it’s exactly the amount of wear-and-tear that one would expect to see on a man like Chief Inspector Hubbard. Note the slight fraying on the bottom of Inspector Hubbard’s sweater. 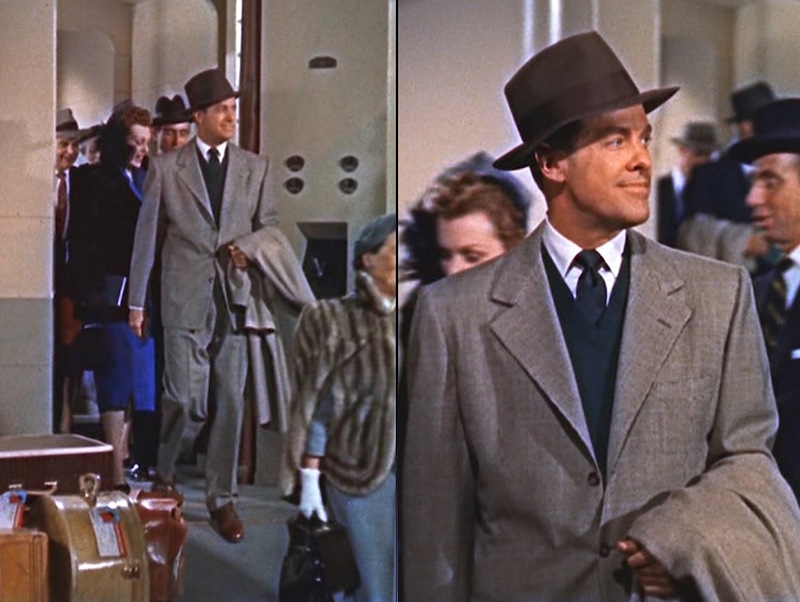 Aside from the now-departed Swann, Hubbard’s is the most distinctly different style of menswear in the film and a clear sign that the Wendices have an “interloper” in their midst. 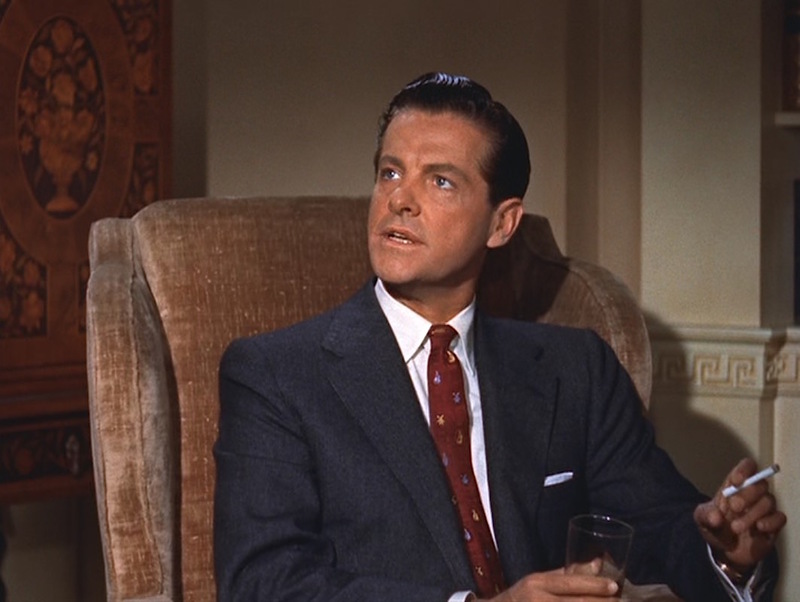 Unlike Swann, however, Hubbard’s taste is more traditional and thus better suited (in a Hitchcock film, anyway) for a heroic role. And speaking of heroes… Mark is the last to arrive on the scene, standing out from the gents questioning Margot by wearing a cool blue suit and a dark burgundy red silk tie. I established earlier that red appears to be Mark’s passion color, and he’s wearing it here as the only man on the scene passionately advocating on Margot’s behalf. Mark’s navy chalkstripe suit: Single-breasted, three-button jacket with wide notch lapels, welted breast pocket (with white linen folded pocket square), straight jetted hip pockets, four-button cuffs, no vents. Forward-pleated trousers with side pockets and likely cuffed bottoms. White shirt with spread collar and French cuffs (with gold cuff links). Burgundy satin silk slim tie. 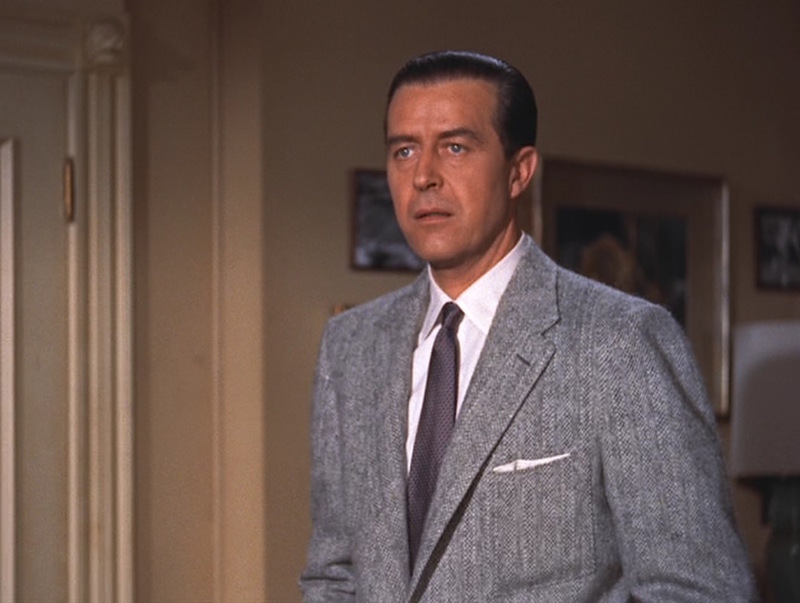 Tony’s gray flannel suit with light blue windowpane overcheck: Single-breasted, two-button jacket with notch lapels, slanted welted breast pocket (with white linen folded pocket square), low straight jetted hip pockets, four-button cuffs, no vents. Double forward-pleated trousers with belt loops and two back suspender buttons, side pockets and no back pockets, turn-ups/cuffs. White shirt with semi-spread collar, front placket, and button cuffs. Navy mini-patterned silk tie (tucked into trousers!) Red suspenders/braces with black hardware and fastenings. Black leather oxfords with black silk dress socks. Hubbard’s gray chalkstripe flannel suit: Double-breasted jacket with low 4×2-button front, wide peak lapels, welted breast pocket (white pocket square, not neatly folded), straight jetted hip pockets, three-button cuffs, no vents. Double forward-pleated trousers with side pockets, back right pocket, and turn-ups/cuffs. White shirt with point collar, front placket, and French cuffs (with gold rectangular cuff links). Navy mini-dotted butterfly-shaped bow tie. Gray cashmere v-neck sweater (slightly frayed on bottom ribbing, right side). Black leather cap-toe oxfords. Black homburg with pinched crown. Khaki raincoat with plaid lining. While Mark is all business, Tony, on the other hand, is dressed in his most casual and laidback getup yet: a textured gray tweed sport jacket. His purple tie evokes the color of royalty as he’s been living the easy life in his self-imposed kingdom since Margot’s incarceration, spending her money. And yet, his tie is knotted in a small four-in-hand, almost restrictively tight as the noose grows tighter around his own neck. 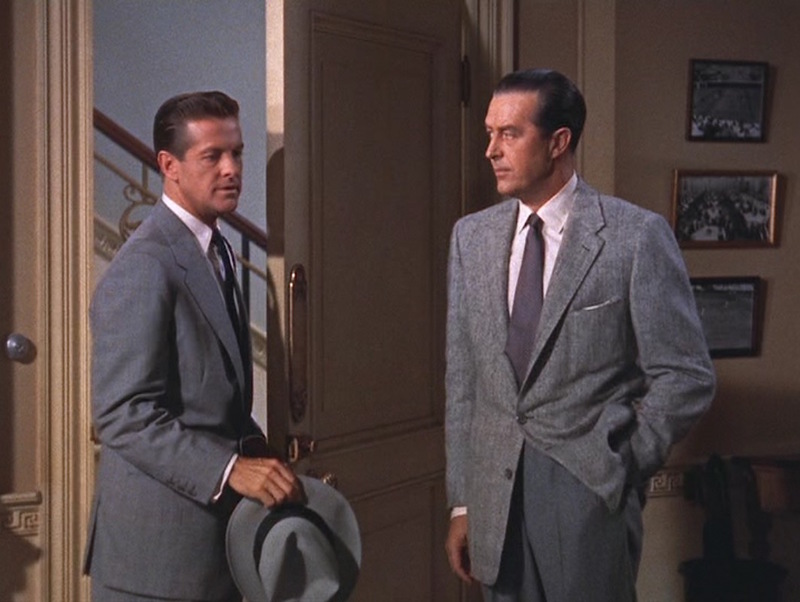 Both dressed in gray, Mark and Tony look considerably less vibrant than their first meeting earlier in the film. One interesting sartorial observation: up to this point, Mark and Tony both wore ventless jackets exclusively. Now, Tony wears a single-vented sport coat and Mark’s suit jacket has double vents. Did men’s fashion really evolve that much over the few months that Margot has been in prison? 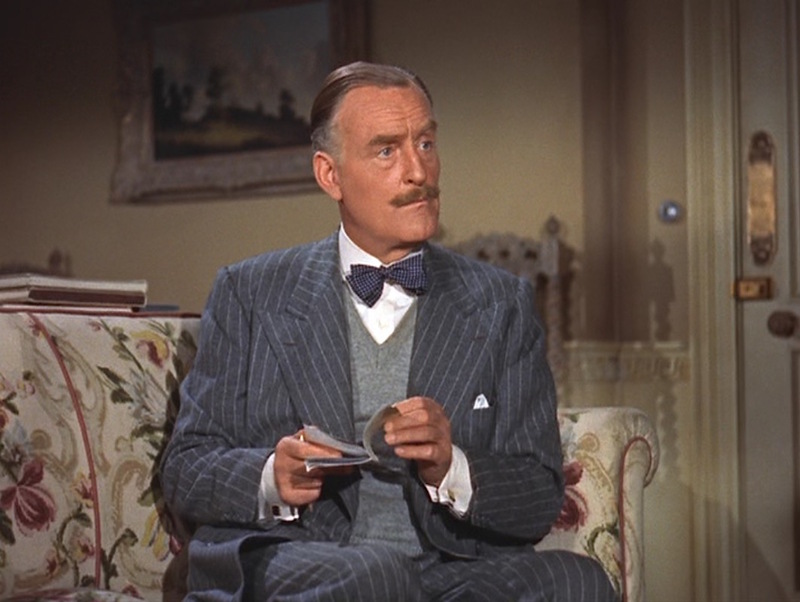 Arriving on the scene is good old Inspector Hubbard, again blazing a trail in a dark striped flannel three-piece suit, the only three-piece suit to be worn by any character. Now, Hubbard is in all navy blue against Tony’s gray and purple; the two are no longer on the same team. Blue is the traditional color of police uniforms… law and justice has finally arrived to save the day. Margot’s POV: an astonished Mark and rather self-satisfied Inspector Hubbard, both in navy ties, greet her upon her unexpected return home. 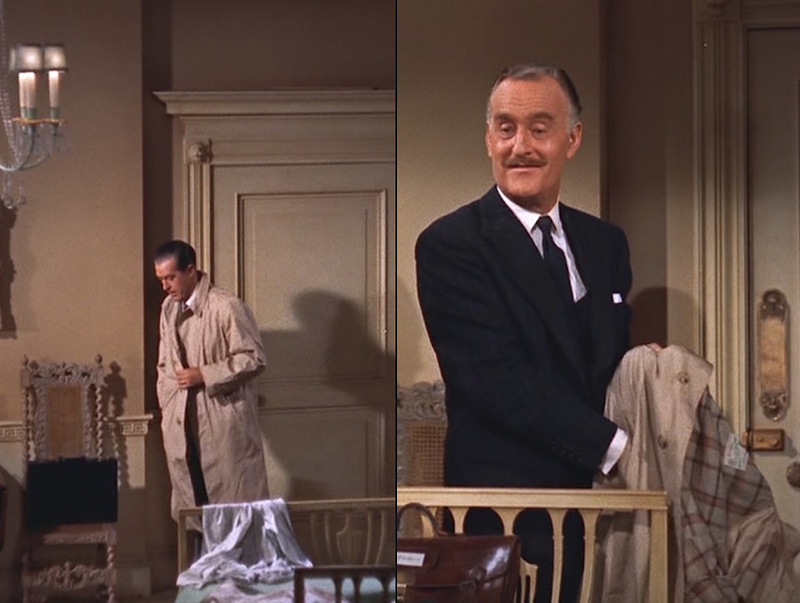 And, alas, this scene also offers the significance of Chekhov’s Raincoat! Hubbard had brought his raincoat for his first meeting at the Wendice home, where its sole purpose was seemingly a quick moment of comic relief as an accidental seat cushion for Mark. Now, Hubbard uses his and Tony’s similar raincoats to conduct a series of switches to prove his theory correct. Six decades later, it seems an anachronistic device as most men rarely wear proper outerwear, let alone outerwear as standardized as the khaki gabardine raincoat was in the early 1950s. Mark’s gray worsted pick suit: Single-breasted, two-button jacket with notch lapels, welted breast pocket (with white linen folded pocket square), low straight jetted hip pockets, spaced three-button cuffs, short double vents. Forward-pleated trousers with slanted side pockets and cuffs. White shirt with spread collar and French cuffs (with gold rectangular cuff links). Dark navy silk slim tie. White suspenders (per behind-the-scenes photos). Black leather cap-toe oxfords with black socks. Pearl gray fedora with wide black grosgrain ribbon. Tony’s gray sportcoat and slacks: Gray textured twill-striped tweed single-breasted, two-button sport jacket with notch lapels, slanted patch breast pocket (with white linen folded pockt square), straight jetted hip pockets, four-button cuffs, and short single vent. Gray flannel trousers. White shirt with spread collar and mitred button cuffs. Purple-dotted lavender silk tie, knotted in tight four-in-hand. Black patent leather oxfords. Khaki raincoat. Hubbard’s navy chalkstripe flannel three-piece suit: Single-breasted, 3-roll-2 buttoning jacket with notch lapels, welted breast pocket (with white linen pocket square), straight jetted hip pockets, four-button cuffs, no vents. Single-breasted, six-button waistcoat with four welted pockets and notched bottom. Double forward-pleated trousers with side pockets and cuffed bottoms. White shirt with semi-spread collar, front placket, and French cuffs (with gold rectangular cuff links). Navy silk tie. Black leather cap-toe oxfords with perforated stitching across toe cap. Black homburg with pinched crown. Khaki raincoat with plaid lining. The soon-to-be condemned man enjoys one last nip. Who drinks it? Tony Wendice, Margot Wendice, and Mark Halliday. What brand of booze? Johnnie Walker Red Label is the Wendice whisky of choice, and Tony even tipples a dram neat at the film’s denouement after he’s been exposed. How do they make it? Pour some whisky straight from the bottle into a highball glass. Siphon in some carbonated water from a soda siphon bottle, and voila! You’ve got yourself a highball. What brand of booze? Though not seen during the actual martini-mixing process, a bottle of Gordon’s can be spotted on the Wendice bar. How do they make it? 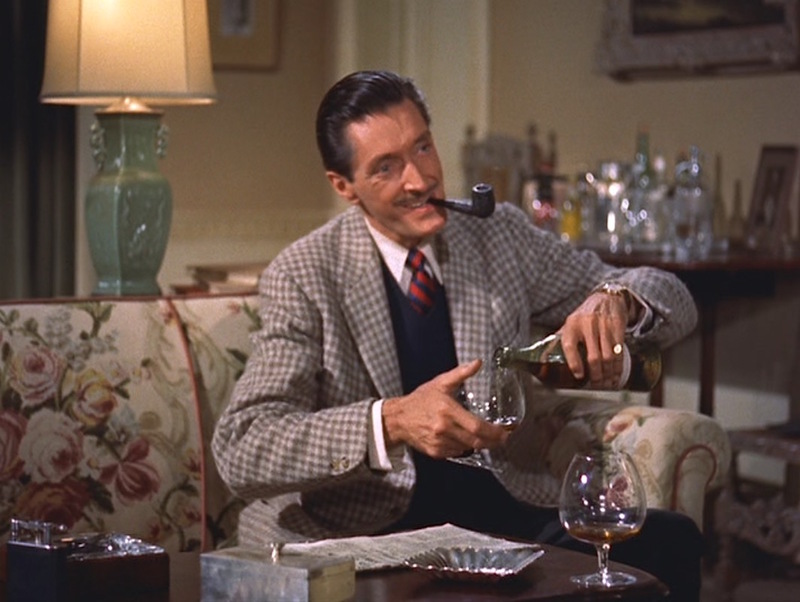 We catch up with Tony halfway through his concocting, but he appears to be stirring gin, ice, and what is likely a small amount of dry vermouth in a glass mixing glass. (Apologies, Mr. Bond.) 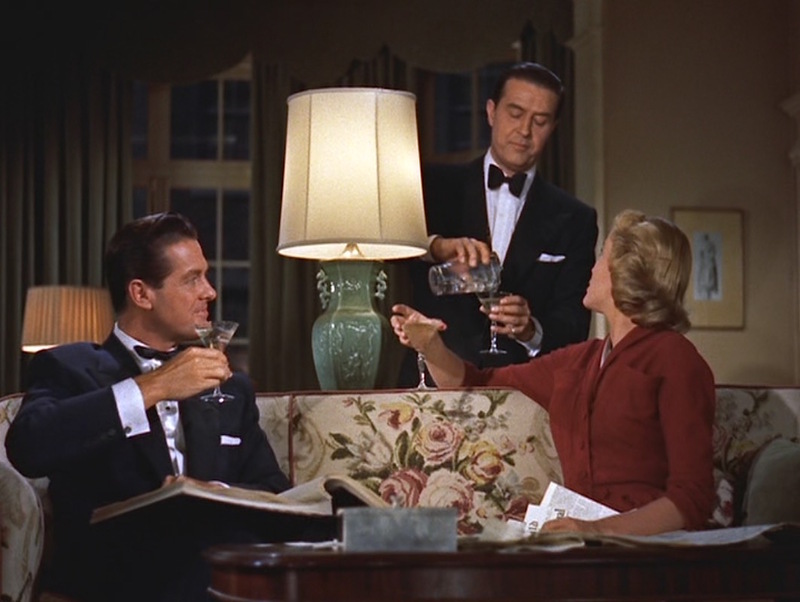 He then strains into three traditional martini glasses and serves them up with no garnish. Tony’s brandy evidently meets with Swann’s satisfaction. Like he would know. Who drinks it? Tony Wendice and C.A. Swann. What brand of booze? 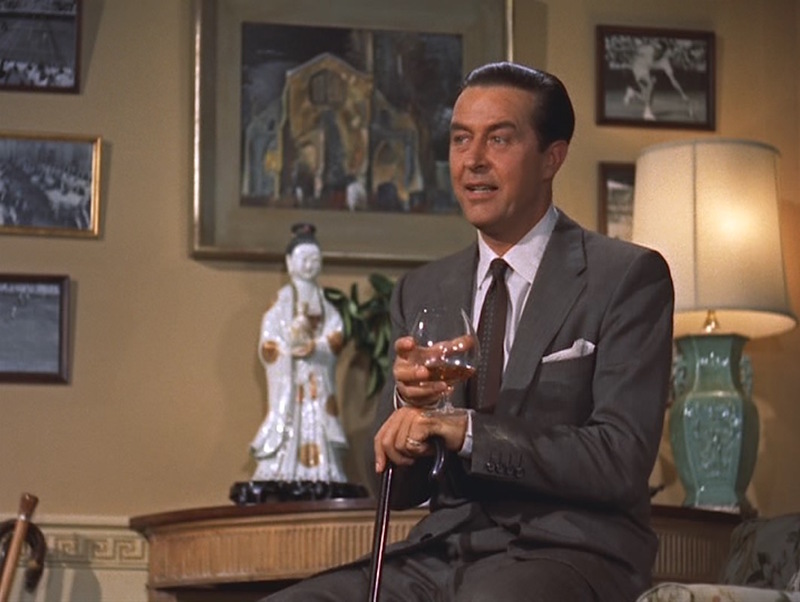 “This calls for a special drink,” declares Tony upon his “reunion” with Swann. “I was planning to palm you off with an indifferent port, but let’s see what we have here,” he says before grabbing for a bottle of brandy apparently named Kennedy’s in red print on a beige square label. The brand is unfamiliar to me. How do they make it? 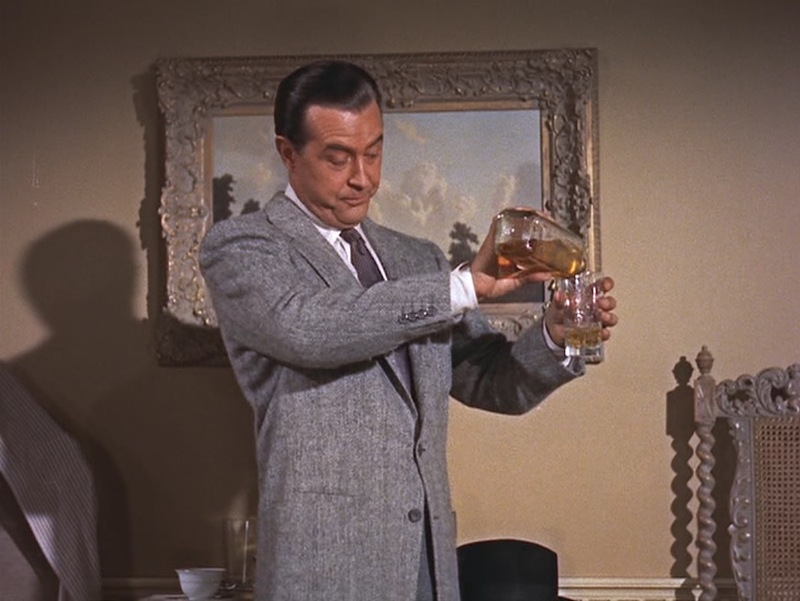 Tony simply pours the brandy into proper snifters for he and Swann to drink. No additions needed. Tony Wendice: People don’t commit murder on credit. Excellent post Nick! Have always loved this film for the clothing. A murder mystery conducted in suits and formal wear. My kinda world! 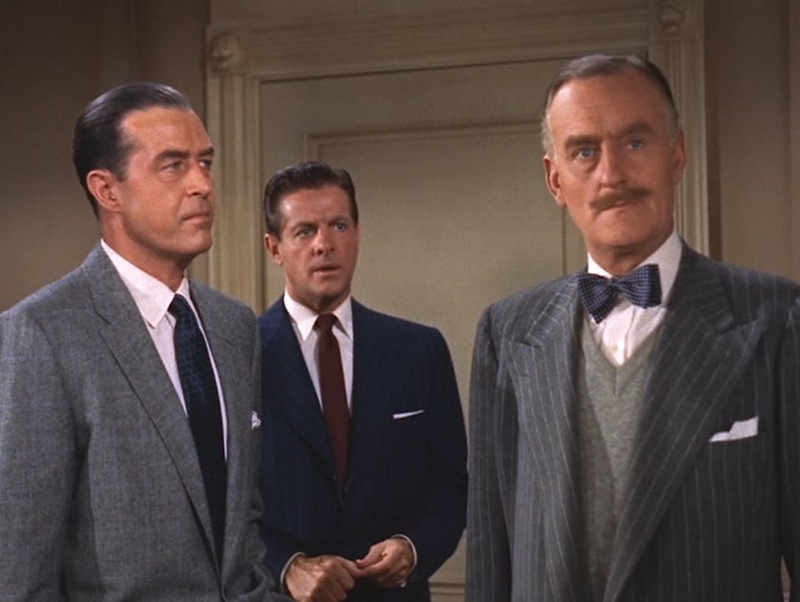 The boldness of Swann’s outfit certainly marks him out as an untrustworthy character with the wide check of the sports jacket and tie stripes going (from a British perspective) the wrong way. It isn’t in bad taste but, compared to the other characters, it clearly isn’t as refined. Film costuming – particularly British film costumes – often marked out the slightly dodgy characters with bolder patterns or more extreme cuts to their clothes. The Boulting Brothers Brighton Rock has some fantastic examples of overly sharply suited villains, with back belts and extreme waist suppression and some heavily checked material. In truth it still reflects the general view of tailoring in Britain which generally disapproves anything flashy. A great description of the fine costume work in this thriller. Hitchcock’s attention to detail was extraordinary, esp. when you consider that he didn’t like the stage play and was forced to film it in 3D by the studio. Tony’s suits, in particular, were superb. I don’t think any other actor, even Grant or Olivier, who could get an audience to like a man who is determined to kill his wife. And, on top of that, relax at the dog track while his wife is about to be executed. A BAMF to the nth degree!